My colleagues and I arrived in Husavik very excited about seeing some whales – we were told of a 98% likelihood, so the chances were certainly looking good, and it turned out to be an even more incredible show than we were expecting! We started with a visit Husavik Whale Museum, the first and only institution of its kind in Iceland (which Discover the World helped to set up), located near to the port. What a surprise! It’s much larger than we expected and has some fascinating exhibits of cetaceans found in the waters surrounding Iceland, including impressive whale skeletons (one of which has a walkway between them). Because of time constraints we only spent an hour here, but we would have liked to have stayed for two or three. We had a light lunch in this pretty harbour town, where there are many restaurants to choose from (decisions, decisions!) before boarding the boat. North Sailing operates six beautiful Icelandic oak boats that have been specially converted to accommodate passengers. 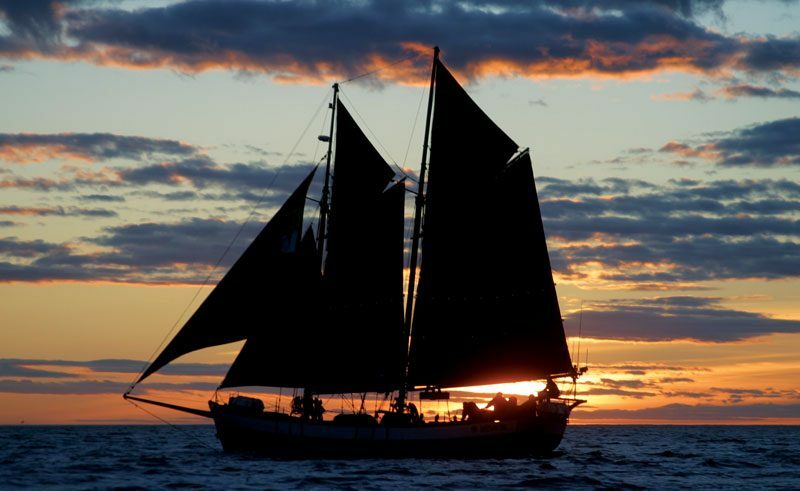 Two of them, Haukur and Hildur, have been transformed into two-mast schooners, the only pair of its kind in Iceland. We were each given flotation suits which were very warm, especially when hats, scarves and gloves were thrown in for good measure. A few of us went up to the higher deck, and upon realising this was a great way to see further out I decided to join them. Camera at the ready, there was a great atmosphere as the guide told us stories ahead of the inevitable first sighting. With the clear skies undoubtedly helping, someone suddenly shouted “11 o’clock!” and in the distance there it was, a whale’s tail! It was in fact a diving humpback, which meant a wait of between five and 50 minutes for it to resurface. Luckily, it only took 10 minutes, and now that the boat was moving towards the whale, it appeared to be getting bigger and bigger. What a sight! Before long, the whale started raising one of his flippers into the air and slapped it down on the surface of the water, which looked like it was waving at us and trying to get our attention, which, in fact, he already had in full. 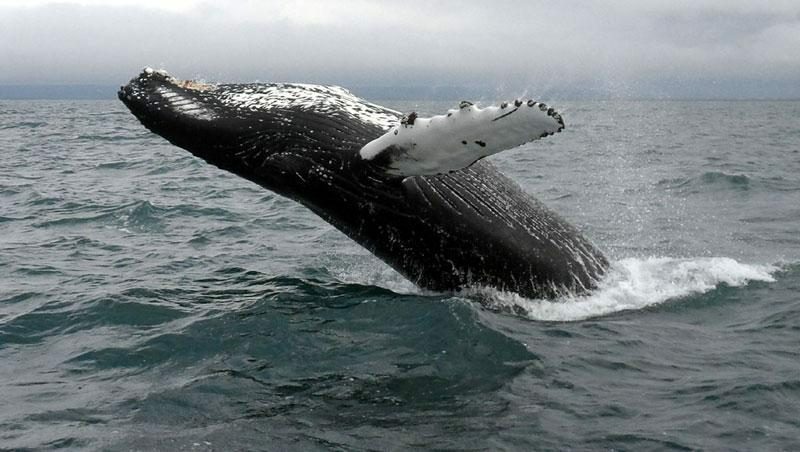 But the best was yet to come – the humpback then started to jump high out of the water, behaviour known as breaching. He even flicked his tail up a few times – we all lost count after 20! The guide said he had never seen a performance like it. Despite also seeing Minke whales and a dolphin, the humpback for me was the outstanding sight. 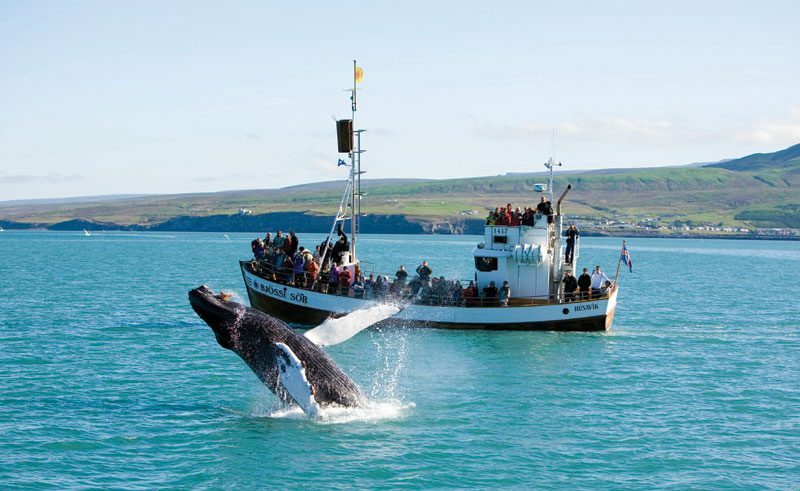 Once the whale had finished his show, the guide decided it was time to return back to shore – the trip had actually been extended slightly because of the spectacle we had witnessed. With hot chocolate and cakes served on the return journey, there was a real buzz on board as all of us couldn’t believe what we had just witnessed. I saw some unbelievable sights and certainly have some great memories of this trip that will last a lifetime. 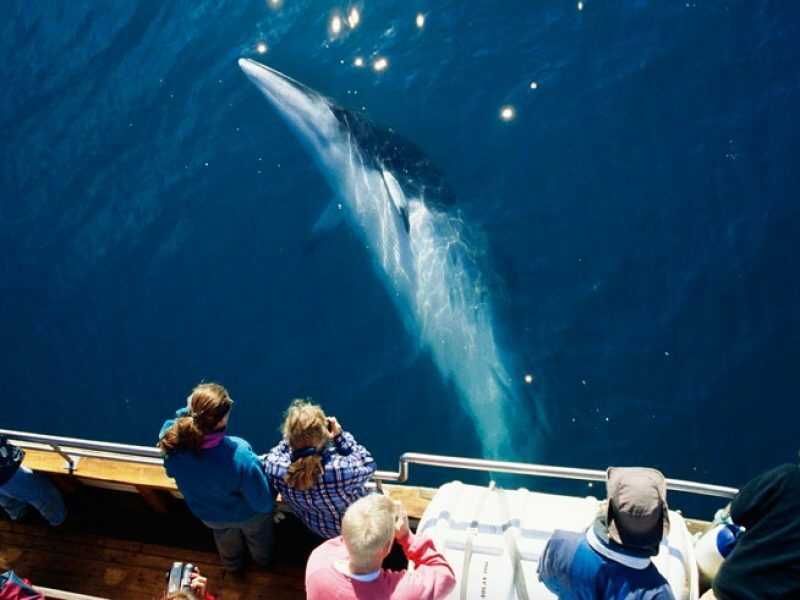 See Iceland’s humpback whales (and more!) on our Husavik Whale Watch Boat Trip in North Iceland or for further cetacean spotting view our whale watching holidays. Alternatively, to discuss your options further, contact our team of Iceland Specialists.